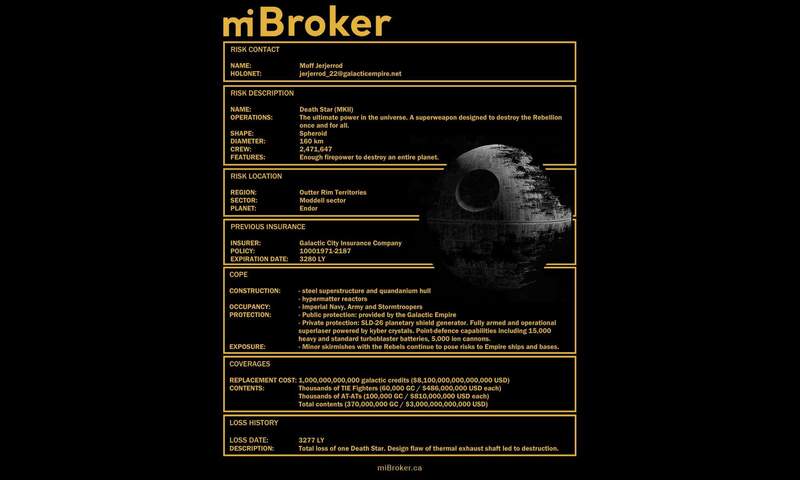 Insuring a Death Star – What does the commercial quoting process look like behind the scenes? - miBroker | home, auto & business insurance on your terms. Insuring a Death Star – What does the commercial quoting process look like behind the scenes? Bored economists and Star Wars fans around the world have tried to estimate the real world cost of constructing a Death Star. Being an insurance broker, that got me thinking; what would it cost to insure one of these things? Aside from the construction risks of such a mega structure, The Empire’s bases and spacecraft are constantly under attack from rebels. The Empire would be wise to look into insurance. For readers who are familiar with their home insurance, insuring commercial risks is a more complex process. There is no standard form comparable to a homeowners comprehensive policy. Commercial policies can vary based on sector, industry and insuring company. A basic stand alone homeowners policy can be quoted in a matter of minutes, more complex packages usually within a few hours, but commercial accounts are not nearly as automated and can take up to 1-2 weeks. The process usually starts by the broker asking the client some questions about their property and business. I had the chance recently to talk with Grand Moff Jerjerrod about his Death Star project, despite his tight timelines imposed by The Emperor. Basic contact details are needed for the file, as well as a description of the risk. For a normal business this would include details like the legal name of the business, how many years they’ve been in business, number of employees. Depending on the operation, the broker might include additional information that the insurer will be interested in. For example, I could have included that all electrical work is sub-contracted to licensed Wookiees. The insurance company needs to know where the property they’re insuring is located. There can be multiple locations. Similar to home insurance, different locations have different exposure to risks like theft, fire, flood or in this case, Rebel attacks. Insurance history can give the insurer a lot of important information. Similar to with a home policy, this enables the insurer to confirm the loss history and if there is a history of policy cancellations. It also proves to the insurer that there has been continuous coverage in place. Without continuous coverage, insurers may be weary being on the hook for past losses that would otherwise be covered by the previous insurer. The new insurer certainly wouldn’t want to be on the hook for lawsuits from the families of all those imperial troops and storm troopers lost in the destruction of the original Death Star. A history of past losses is usually included with the date, a description of what happened, and the amount of insurance paid out. The current 100% destruction rate of Death Stars doesn’t bode well for this policy being cheap, or even insurable. COPE is an insurance acronym for Construction, Occupancy, Protection and Exposure. These are the main factors that insurers weigh when calculating a premium for property insurance. Construction – The materials and methods used in construction affect the premium. Building’s constructed out of combustible material, like frame construction, will typically attract higher rates than one constructed out of non-combustible material, like concrete block. The number of stories and total square footage can also come into play. Occupancy – It’s important for an insurer to know exactly what a space is being used for. A hazardous process, like running a munitions factory for The Empire, will be rated higher than something less hazardous, like a print shop making condolence cards for storm troopers lost in battle. Protection – Protection deals with public fire protection, like proximity to fire hydrants and fire halls, and private protection, like monitored alarms and sprinklers. Public fire protection especially has a substantial affect on premium with rural properties lacking fire hydrants often being more expensive to insure than a comparable property in a hydrant protected urban setting. Exposure – The exposure or susceptibility of the property being insured affects premium charged. A non-combustible building is less likely to be damaged by fire than the stock that is being stored there. Therefore the stock would likely be charged a higher rate per dollar than the building. With a homeowners comprehensive policy the coverages are mostly the same, only limits need to be tailored to the homeowners specific home. This is not so in commercial insurance. The broker needs to assess the unique exposures their client faces and ensure they’re adequately covered. Most businesses have some contents to insure, even if they’re renting space. These can be further subdivided into things like equipment, stock and office contents. Most business policies carry Commercial General Liability (CGL). Your CGL section will cover you if you directly cause harm to a third party and are sued. Typically this is calculated based on the business’ annual gross revenue or payroll. These values give the insurer a better idea of the size of the business and the relative risk they’ll be involved in a lawsuit. For an operation the size of The Empire, their limit would be truly astronomical. Many other coverages are common to commercial insurance policies. Business interruption can protect owners if they’re forced to close for an extended period. Errors and Omissions (E&O) coverage is for indirect harm to others, typically through rendering professional services like legal or accounting advice. Non-owned auto, for employees using their personal vehicles for work. There are many more available for the unique risks faced by your business. While a Death Star may be difficult and prohibitively expensive to insure, our commercial insurance team has experience with more conventional businesses and hard to place insurance. An independent broker can help look ahead for potential bumps in the road that could derail your business. Being properly insured is often required by landlords and will keep your business running even when the worst happens. Give us a call today to discuss your commercial insurance needs!